Have you heard about Local Yarn Store Day? Also known as LYS Day, this event is going to be a ton of fun! It's all about getting in your favorite store and supporting why they're there. The community that a local yarn shop provides is unmatched with other retail stores or finding yarn online. April 21 is a new holiday to show your favorite LYS how much you love them. You know I love my Ewe Ewe yarn shops. Having managed a yarn store for three years, I have a great understanding of what it takes to create a welcoming environment day in and day out. These shop owners what you to have a great experience every time you come to their store and Ewe Ewe is here to help. Meet our LYS Day exclusive design... Ewe So Summer! YASSS! Look at that shawl, queen! It's so fabulous, isn't it? Let's look some more. Ewe So Summer shawl is a big, generous wrap! Ewe So Summer is designed by The Unapologetic Knitter using Ewe So Sporty merino yarn from Ewe Ewe. It's a great pattern that uses slipped stitches and a modified seed stitch to create tiny transitioning pockets of color. Pretty perfect! Plus, it's edged with a beautiful picot bind off. The Ewe So Summer shawl will be available starting Saturday, April 21 through local yarn stores and ONLY local yarn stores. Kinda cool! So what does that mean? It means you'll need to head in to a brick and mortar store to get this new design (and hopefully the yarn to knit it!). Where can I get this project? I will keep updating this list as we get more shops. But! The Ewe So Summer pattern will be available at ANY yarn shop not just ones that carry Ewe Ewe Yarns. Ewe So Summer can be purchased through a yarn store on Ravelry beginning April 21. Why: Because yarn stores are awesome! Questions? Comments? Let me know in the comments below! How long has your shop been open? We celebrated four years on August 1st! Congratulations, that is so exciting! I hope you had a great party. What does your shop specialize in? Stash is offers a variety of yarns for all types of knitters and crocheters. We also provide specialized customer service through helpful employees, as well as classes designed for beginners to advanced knitters and crocheters. Helpful stores are the best stores! What kind of projects do your knitters like to make? Accessories, we love them! Hats, cowls, shawls, mitts, you name it. We have great sweater knitters too; it’s amazing the talent that we get to see everyday. Wooly Worsted is perfect for accessories and gives great stitch definition. What's your favorite color of Wooly Worsted? My favorite would definitely be Teal! Teal is lovely, but I love them all! Ewe Ewe has great accessories knitting patterns, what's your favorite Ewe Ewe pattern? It’s hard to choose, I love them all! But my favorites would be the Whenever and Wearever Wrap patterns. Knit and crochet! Those are two of my favorites, too! Thanks for taking the time to chat with Ewe Ewe. Does Stash have any events coming up? Stash is part of the Yarn Crawl Along the Rockies! From September 21-29 all the Denver area Front Range shops, 23 of us, will be hosting the yarn crawl! This is our second year and we are all looking forward to another fun event! That's great, I love a good yarn crawl. I hope it's a huge success! Thanks, Crystal! Have a stitchin' good day! Come visit Find Your Stash! We had our launch on March 23rd so we are just 6 weeks in! Congratulations, that's so exciting! So what does your shop, er... truck specialize in? We are really trying to carry a lot of local products that are made by local companies which is why we wanted to add Ewe Ewe to our stock. We have yarns, accessories and patterns all created by companies that are based here in California. We do also carry other products but the local aspect is something that we feel really sets us apart from many of the other yarn stores in the Los Angeles area. I love the idea of a California-centered shop! Are Californians making fun things? Since we are so new, we haven't had too many people come back and show us their finished projects yet. But many people have been buying yarns and told us they were making shawls. That's perfect for California! Are any of them Ewe Ewe patterns? Our store really tries to show an equal amount of both knit and crochet patterns and we just love the Wearever Wrap! I love to knit and crochet and Wooly Worsted is perfect for that. Do you have a favorite color of Wooly Worsted? All of the colors of Wooly Worsted are so wonderful but if pushed to choose just one, it would be Red Poppy. But we are also super excited to see and start working with the new colors! So where can knitters and crocheters find the Yarnover Truck? We are trying out different locations every weekend. We are working to try and have a couple of regular spots that we visit every month but since we are so new we are still working those out. I think we will probably have one in Orange County, Burbank and likely Santa Monica. The best way to find us is to check our calendar of events on our website. Thanks for the chat, ladies. I can't wait to hang on the truck some day soon! Click here to visit the Yarnover Truck. Wooly Worsted merino wool yarn is sold in local yarn shops all over the country and our new series, Yarn Shop Interviews gives a little taste of what knitters like to make with Ewe Ewe! 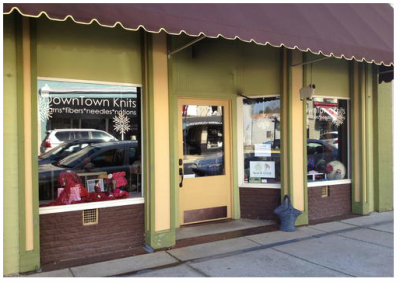 DownTown Knits was the first yarn shop to carry Wooly Worsted! Here's what Michele and her knitters are up to at this adorable North Carolina yarn shop. How long has your shop been open? Two years as of May 13th! What does your shop specialize in? Unique yarns, local yarns and creating a community experience! What kind of projects do your knitters like to make? Sweaters, hats, lots of cowls and baby items! What's your favorite color of Wooly Worsted? Hmm this is hard, I love them all and so do our customers! What's your favorite Ewe Ewe pattern? Beach Bum Pullover baby sweater knitting pattern, we even have it featured in our shop. We also love the Happy Cowl!